Adriana tries to focus on settling down with one man as opposed to several being the whore she is, while Emmy trades in her innocent, virginal persona for a slutty one after being dumped by her boyfriend and begins to sleep with every man in sight. Leigh faces her immediate future as she deals with preparing for a marriage to the man she doesn't truly love. Of all three women, Leigh is the person I relate to the most because her story is the most realistic. The characters Adriana and Emmy are so comically written; not in a funny way, but in a ridiculous, fake, far-fetched fictional way. 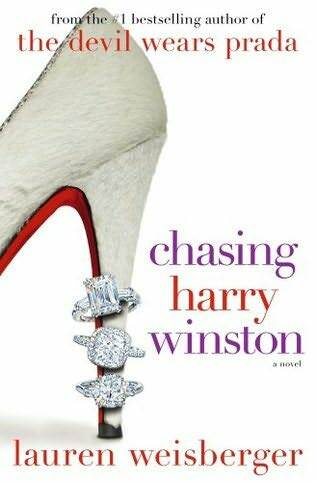 Yes, yes, I know Chasing Harry Winston is a work of fiction, but the characters were too silly to truly enjoy reading about. Usually chick-lit novels are so incredibly fun that I fly through them, but this particular novel took me two weeks to drudge through! I seemed irritated with it each time I picked it up -- not good any time you read a book. However, my dedication and satisfaction with The Devil Wears Prada (2003) and Everyone Worth Knowing (2005) kept me going on to the end. Not every book by an amazing author can always be perfect, so I forgive Lauren Weisberger for Chasing Harry Winston . I've already got Last Night at Chateau Marmont (2010) on my wish list. I so agree.. I had SUCH a hard time getting through this one. I couldn't believe how bad it was. I haven't read 'Everyone Worth Knowing' yet, but I actually own a copy of it... so eventually I will check it out! I'm pleased to see I'm not alone with my opinion -- this was one of the poorer chick-lit novels I've read in quite a while. Yes, definitely check out Everyone Worth Knowing, it was much more fun!